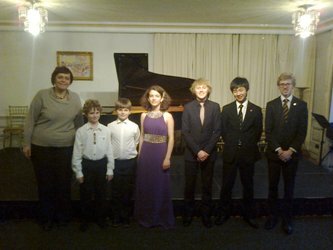 For this visit, professor Katya Lebedeva from the Royal College of Music Junior Department visited the island along with three of her outstanding young pianists. Local advanced pianists from the academy had the opportunity to receive tuition from professor Lebedeva in the morning, following which the whole group had lunch together before rehearsing for the concert. The concert in the afternoon gave the opportunity for all students to perform, and a wide variety of works were performed to an enthusiastic audience of families, friends, and young musicians. Our thanks go to the Jersey Arts Trust for their sponsorship of this event.